For James Bond fans it doesn't get much better than this! Enjoy a fun-filled day out in the capital which includes a two-course meal and two tickets to the incredible Bond In Motion Exhibition. Sit down to a tasty two-courses at Fire and Stone - serving only the best authentic pizzas, with original flavour combinations from around the world, in a warm, rustic setting. 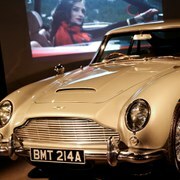 Either before or after the meal, head over to the London Film Museum for Bond In Motion. This official exhibition is the largest of its kind ever staged in the capital with the largest official collection of original Bond cars. The sensational collection of original vehicles, props, film reels and story boards used in the acclaimed 007 film series make it a sure fire hit.